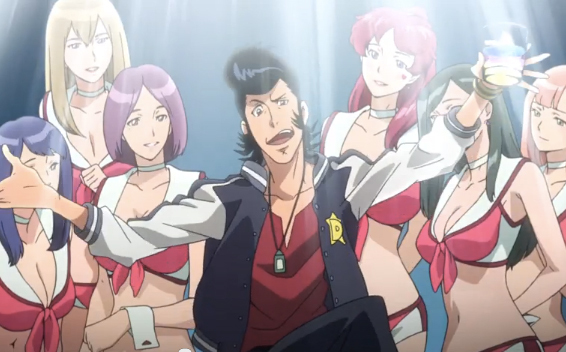 Space Dandy a victim of Hype? More than anything this is really a first Impressions of Space Dandy, but it also highlights the fact that hype can really destroy the enjoyment of what otherwise would be a pretty good show. Anyway the first three episodes of Space Dandy, arguably the most anticipated show of the winter season, have aired, and I cant help but be a little disappointed with what we’ve seen so far. When Space Dandy was first announced it was more or less presented as a comedic Cowboy Bebop, with Shinichiro Watanabe and many others from the staff of Bebop returning to work on the show. The show was even being simul-dubbed in the US further suggesting that Space Dandy was going to be something spectacular. But so far the show hasn’t displayed any of the clever story telling present in Bebop and hasn’t even come close to matching the comedy of Bebop, even with the comedy being the main focus of Space Dandy. Perhaps I am being too unfair on the show comparing it to one of the greatest series of all time, especially considering I only just finished watching Bebop for the first time last night, but even without the comparison Space Dandy still suffers from a whole host of problems. One of the shows main problems thus far is that it doesn’t have a central plot of any kind, yes I understand that the show is is episodic and isn’t meant to have a serious central plot. However even within each episode there really isn’t any plot to speak of, stuff just happens. Episode one and three are especially guilty of this, with the many of the events of episode one occurring randomly, with the rules of the shows universe not having been defined. For example, Dandy, in episode one, for some reason has a secret weapon in his possession that can destroy whole planets, a fact that is never really explained. This would be fine if these moments provided some extra comedy, but even the best of these moments provide only a small chuckle now and then. Thankfully episode two actually provides a more coherent story as our hero’s search for the “phantom ramen”, but even with a well defined story the show ultimately fails because its just not that funny. Yes it is amusing in some places, but when a show is relying almost entirely on comedy being just amusing doesn’t really cut it. 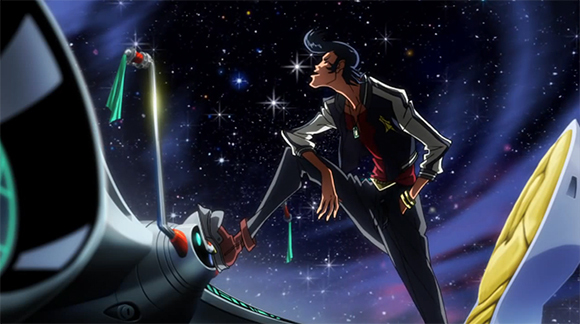 That’s not to say that Space Dandy is all bad, from a production stand point Dandy is up there with the very best. The music is,umm, Dandy, with some really nice jazz tracks and the action sequences are up there with some of the best from Cowboy Bebop. The design of the shows aliens and its art style in general are also incredibly imaginative, its just a shame its not put to better use. Its a shame that with so much creative talent on show most of our time in Space Dandy is spent on the Aloha Oe, in Boobies, or on some desolate planet. Hopefully we’ll see more of the world as time goes on, after all the show is set to run for another twenty three episodes. 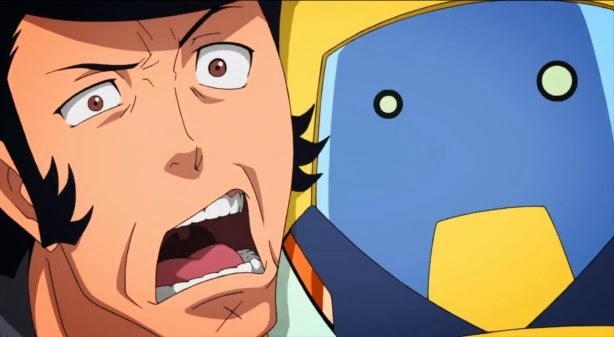 Okay so Space dandy was never going to be as good as Cowboy Bebep, expectations of the show were far too high, but even so its a massive disappointment. While the show was definitely over hyped due to its staff, I could definitely see myself dropping the show if the director wasn’t Watanabe. Hopefully the show can redeem itself in its remaining, because the shows premise is too good to go to waste.